On a recent article by ZDNet and the New York Times, researchers have found two critical vulnerabilities on Intel chips that can potentially let an attacker steal data from running applications. The researchers have dubbed the vulnerabilities as Meltdown & Spectre. A lot has been written about these vulnerabilities over the past few days, and Microsoft has since released a security patch to address this. As it makes some fundamental changes which are outlined on the Microsoft support pages, the patch does not automatically download and install on systems with Anti-virus software installed, save for a few supported ones. This is to allow Anti-virus software vendors ample time to test their offerings to be compatible with the security patch. This is why if you can’t see the update, this is normal. The SecureAPlus Team has already conducted tests and has found that the patch is compatible with SecureAPlus 4.7.7 and above. 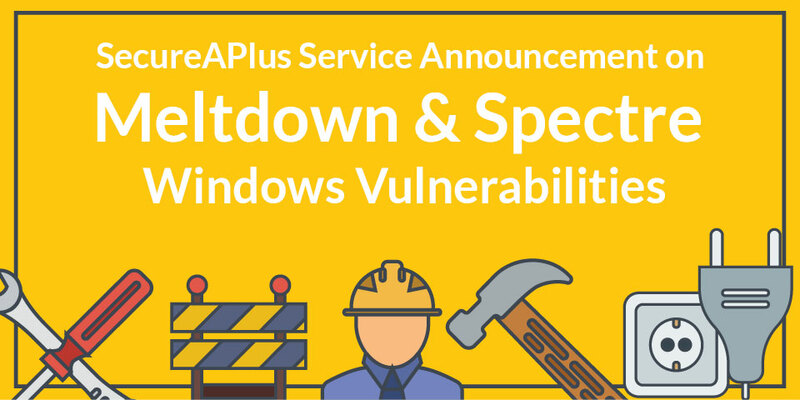 For instructions on how to get the security patch installed on systems with SecureAPlus, please refer to our Forum Post on this topic below. It is worth noting that this vulnerability has far-reaching consequences to a lot of devices that are affected, and while there have been no significant cases that exploit this as of the time of this writing, we strongly encourage our users to follow the steps outlined in the forum post and download the security patch by Microsoft.